It’s amazing how often the more memorable projects which present them selves in this industry arrive when you least expect them. I’ve been fortunate enough in the still primitive stages of my career to work with some amazing people both in front of and behind the camera, and filming ’23’ with two of my childhood heroes was obviously no exception. It was 11am when I got the call from Winner & Mandabach, a marketing & campaign company which I have worked with previously. I was informed about a special, last minute project scheduled to begin filming in 28 hours time, and whilst still on the phone discussing the project, the laptop sang the song of an incoming email, or in this case, script. Once I read through the initial concept and saw the names attached, the 28 hours pre-production deadline we had now felt like 30 minutes. In that time, we had to book the film crew, refine the script, brief them on my vision, and design how the commercial would look and flow. 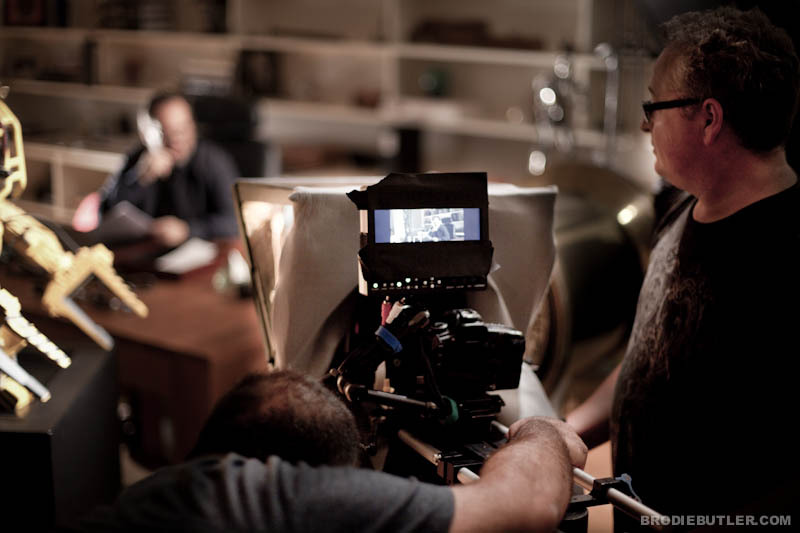 The foundation of the commercial was of a political nature, however like the past commercials I had directed for this particular marketing company, this commercial allowed for a ‘different’ approach as well as some unconventional rule breaking which fell right into my niche. 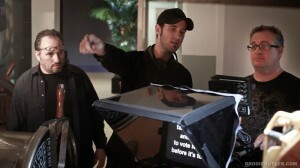 To get you up to speed: The commercial we had to produce was to entice voters to vote NO on Proposition 23. For those of you outside of California, Prop 23 is a proposition funded and backed by two Texan oil companies which if allowed to pass would essentially devastate the current Californian environmental laws in a bid to relax pollution & clean air laws, in turn fueling environmental health issues & destroying thousands of ‘clean energy’ jobs. No on Prop 23 website. That is it in a nutshell, but as is with every proposition there are two sides to the story. This is not the right forum for debate, but I personally am all for being conscious about the environment, so thankfully I was already passionate about shooting this commercial with Jim & Arnold and making a difference. Along with various other outspoken environmentally aware celebrities such as Leonardo DiCaprio, both Arnold Schwarzenegger and James Cameron have felt strongly for the environment for many years. Cameron has in fact donated a ‘substantial’ amount of money to help promote the ‘No on 23’ campaign and wanted to finish off with a viral commercial starring himself and long time friend & college Arnold. James’ love and concern for the environment has also been evident in several of his films including his latest film ‘Avatar’ from which the foundation of the narrative highlights the theme of environmental destruction. 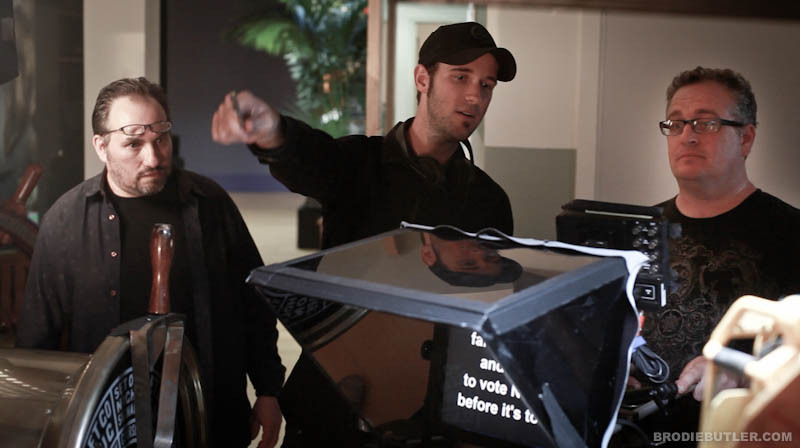 The commercial was written and directed specifically for viral marketing online through YouTube, Twitter, Facebook and email, so the commercial had to be quirky enough for fans to want to forward it around, yet still retain a serious motive and successfully deliver the message contained within. To do this, we blended a serious political message with a short dose of lighthearted comedy. 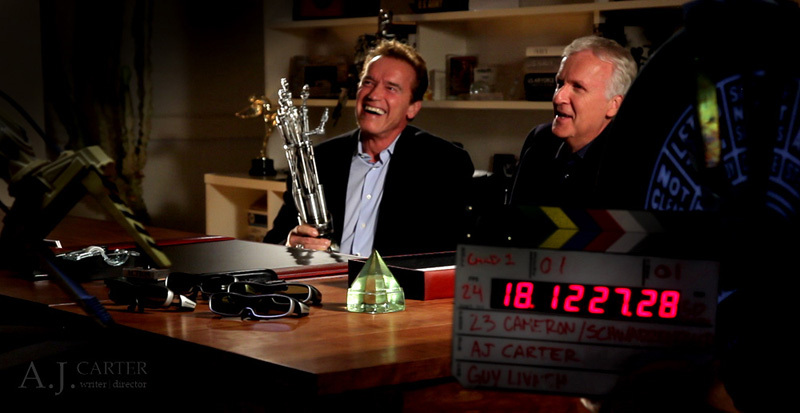 The bulk of the script was layered with the use of specific verbs encompassing subtle references to previous films which Cameron had written & directed… “terminating our air pollution standards, sinking our clean energy economy and exploiting our environment for profit.” To add an extra element of viral appeal, we pulled in Arnold Schwarzenegger for a short cameo at the end who served as the catalyst for the comical element of the commercial. Being a high profile political commercial, ’23’ had to undergo a rigorous approval system which included the spot being passed through several layers of hierarchy within the marketing company and screenings for both James and 3rd party focus groups. So why all the fuss over approvals and focus groups? Politics & comedy are rarely married together, so the biggest risk the marketing company had with such a commercial was that the opposition (Vote Yes on 23) would play dirty and extract the comedy aspect inherent in the commercial and use it against Cameron and Arnold’s campaign. Because we were uploading a full High Definition version of the final piece to YouTube, it would be very simple for the opposition to download the spot & create a nasty TV commercial portraying the comedic value in a negative light and out of context. During the approval process, I cut almost 20 versions of the commercial, all slightly varied in one way or another, from music timing, graphics, fonts and multiple comedic endings. The original cut (which was never released) runs for an extra 10 seconds at the end and provides us with a little more comedic interaction between Cameron and Schwarzenegger, poking fun at Arnold’s Hollywood stardom as a Cyborg. Both Cameron & myself liked the more risqué cuts where he and Arnold played up a little, but the marketing company would always reel us back into line, which was surprisingly entertaining to see how much we could get away with. ** Please pause the video until it has fully downloaded to avoid skipping. Then click play. On Set filming with two of the most influential men in Hollywood was a very humbling experience. It was the first time in 16 years James and Arnold had been together to film since the Hollywood blockbuster True Lies in 1994. This special reunion combined with the nostalgia radiating from hundreds of movie prop pieces from Titanic, The Terminator and Avatar neatly displayed throughout James’ office, filled the set with an enlightening energy which was almost indescribable. Working with James & Arnold was an absolute pleasure and was surprisingly not daunting at all. I was extremely confident and refined in what I needed to do and the time frame we had to do it in, which I think they appreciated. There was even some downtime in between takes where the Accademy Award® winning Avatar director joked “so this is what it feels like!” in reference to him being out of his element and now in front of the camera taking direction. There were also a few times where I needed Arnold to adjust the timing of his line delivery, and he just listened intently before following through perfectly on the next take. They were both true professionals and gentlemen which undoubtedly aided in rendering any nerves I may have had non existent. 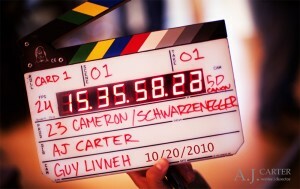 The Release, thanks to a sneaky tweet or two from Schwarzenegger during the weeks leading up to the shoot, was met with much online hype as whispers emerged of Cameron and Schwarzenegger reuniting for a mysterious commercial project. The commercial was proudly unveiled by Cameron and Schwarzenegger during a live broadcast at 3pm October 27th 2010 Californian time, 6 days before the final voting date. Within hours of its release on YouTube, the commercial went viral and made news headlines in newspapers all over the world. Within 96 hours the spot had received over 50,000 YouTube hits and became the most successful campaign ever run by Winner & Mandabach resulting in a landslide win – 61% No on Prop 23 vs 39% Yes. It is a wonderful feeling and an honor to have worked with such esteemed & influential members of the industry, who for a few hours afforded me the rare opportunity to collaborate and share my creativity with them, all whilst doing my small part in making the world a better, cleaner place. This is one slice of the film career pie I’ll never forget, and the landslide political victory we had as a result just made it all that much sweeter. I must thank Neal Krone, Leo Wallach and the entire executive team from Winner & Mandabach for presenting me with this wonderful opportunity and entrusting the vision of this project in my hands. My entire crew who came to the party with only a days notice, in particular, my Director of Photography Guy Livneh who made the spot look fantastic with such a short amount of time and limited resources. And finally a big thank you to James Cameron and Arnold Schwarzenegger for taking a few hours out of their busy schedules to make the shoot possible and for their dedication to making the world a better place.. one Cyborg at a time. Filming ‘The Reckoning’ down under.